In the Netherlands and a lot of other European countries pigeons are a nuisance. They’re grey, dirty and always in really big groups that just seem to be out there to munch on the leftover chips from the bin. I certainly didn’t think I would ever like a pigeon. Not until I saw the NZ native version, the Kereru. Its shape reminds me of his European cousins, but its much much bigger. It can weigh up to 650 grams! This weight can cause some interesting spectacles when they’re trying to land in the trees as they are known to crash. 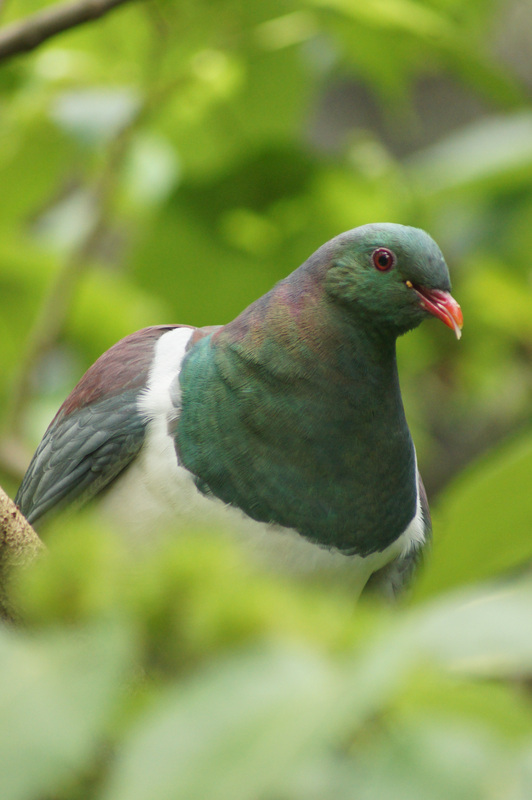 They used to be an important part of the Māori diet, but luckily hunting Kereru was banned in 1920’s and currently they are still fairly common. And its not only his weight that is different. With its beautiful green shiny feathers and lovely white bib he is definitely the royalty under the pigeons. It’s great having the king around In our trees!